Shirts With Random Triangles: Maty Mauk Is An Ex-Missouri QB, Dismissed From Team. Maty Mauk Is An Ex-Missouri QB, Dismissed From Team. Maty Mauk. Image via kctv5.com. 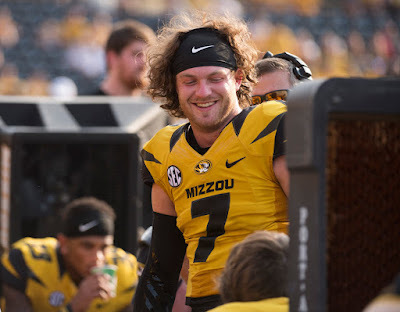 Maty Mauk is an ex-Missouri Tiger. Missouri has dismissed the embattled former starting quarterback for an ever vague "violation of team rules." The move comes three days after a brief video clip allegedly showing Mauk snorting an "unidentified white powder" went viral on the Internet. An unidentified member of the Missouri football program told The St. Louis Post-Dispatch that the video "was taken two years ago." In a statement released by the school, Missouri head coach Barry Odom denied that the video had anything to do with Mauk's dismissal. While Odom seemed to support the claims that the video was "from a long time ago," he stated that the dismissal was due to "Maty's failure to live up to expectations in recent weeks." Mauk had been suspended by the school on Monday, shortly after the video surfaced. It was the third time that Mauk had been suspended since the start of the 2015 season. USA Today reports that Mauk, a junior at Missouri, could qualify for a graduate transfer if he was able to earn his degree "by this summer. "He would thus be eligible for participation for the 2016 season.